Winning Academic Papers, presented in the ResearchEdge poster sessions following the Call for Papers. 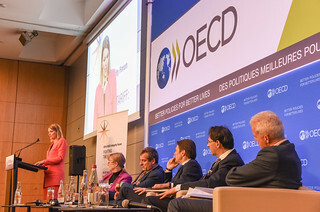 OECD’s Integrity Forum has become one of the leading public fora on integrity and anti-corruption worldwide, bringing together relevant policy communities as well as the private sector, civil society organisations and academia. It takes place during the broader context of the OECD Integrity Week. The more general Integrity Track, will focus on other pressing integrity issues, such as the refugee crisis, climate change, extractive industries and state-owned enterprises. In response to fast-moving insights from integrity research and practice, the Integrity Forum invites pioneers from a variety of backgrounds and academic disciplines to share their latest evidence and findings. Through poster sessions, participants are inspired to join the debate for mobilising integrity data to advance policy insights. The poster sessions connect academic insights and evidence with policy-making. They highlight a selection of innovative research on integrity, anti-corruption and trade, resulting from a competitive Call for Papers by the OECD. Research covers topics such as Collective Action, Countering Illicit Trade, Proofing Supply Chains against Corruption, Corruption in Infrastructure Projects and the Impact of International Conventions to prevent Corruption. The invited researchers will present their findings during the Integrity Forum ResearchEdge poster sessions and guided poster tours will be offered by renowned academics. The full papers can be found here. International trade is a motor of the global economy and represents increasingly large volumes of goods, services, and financial flows. Yet, the economic benefits resulting from trade can suffer from a lack of integrity throughout the international supply chain. This can result in a substantial loss of revenue for governments, and can hamper competition and business activity. It can also entail important health and safety risks for societies. Integrity measures that protect cross-border trade not only produce advantages for the economy in general, but also for private companies, the public sector and society as a whole. The 2016 edition of the OECD Integrity Forum will put the spotlight on this hidden tariff. It will bring stakeholders to the table to develop a long-term vision for clean trade. The Integrity Forum fosters dialogue for policy actions and cooperative integrity efforts to prevent corruption in customs and to protect supply chains. In addition, new evidence and insights will be shared for countering illicit trade. High-level speakers will confront the issues of corruption that impact global trade, informal sessions will provide an opportunity to examine solutions in greater depth, authors, academics and students will share their findings during poster presentations, and lunch debates and roundtable discussions will give you the opportunity to share your experience directly with your peers. Recent economic, geopolitical and demographic developments have underscored the growing complexities that governments, businesses and citizens face in our increasingly globalised world. The Integrity Forum provides a platform to address the integrity dimensions of these pressing challenges. Moreover, the Integrity Forum zooms in on new integrity instruments and responds to the growing demand for evidence-based policy recommendations. Ordinary artefacts tell the story of how corruption occurs in our daily life. Which corruption mechanism has affected you personally? This art exhibition, opening at 9 on Tuesday and available in the OECD Conference Centre throughout the week is organised by La Transplanisphère.